Easy to give-away Sunday School prizes, the mixed pack contains 15 pencils for children with a mix of designs and Christian messages such as Fruit of the Spirit, 10 Commandments and various motivational Christian encouragements. Super pack of 15 brightly coloured pencils each with a message shot, bold and simple truth or a verse from the Bible. Ideal for school, Sunday School, play group or holiday club. Practical to use with pencil-top eraser or award as prizes, keep-sakes, thank-yous and party bags. Just the kind of thing for children to take home and treasure or help them make an easy witness. Collectable gems for school pencil cases and home study desks. Keep a few pencils next to the computer, by the phone or in the kitchen. Great give-aways for evangelic and outreach campaigns. Mixed Pencil Value Pack is published by Eden.co.uk and is our 131st best seller. The ISBN for Mixed Pencil Value Pack is EDENSSPEN1. Ordered two packs and received a selection of seven different designs, a mix suitable for both younger and older kids. The pencils I got all have erasers. Very pleased with the colourful selection! - God's Love is Awesome! - Jesus Loves Me, This I Know, For The Bible Tells Me So. Got a question? No problem! Just click here to ask us about Mixed Pencil Value Pack. A:I am afraid the packs are pre-made, with each pack getting one pencil of each design, and cannot be changed. The majority of the pencils do bear Bible verses, though. Thank you for using the Q&A Forum. A:They are expected to arrive with us on Wednesday (22/3). Thank you for using the Q&A Forum. A:The expected date for the Mixed Pencils is the 15th of July. Thank you for using the Q&A Forum. 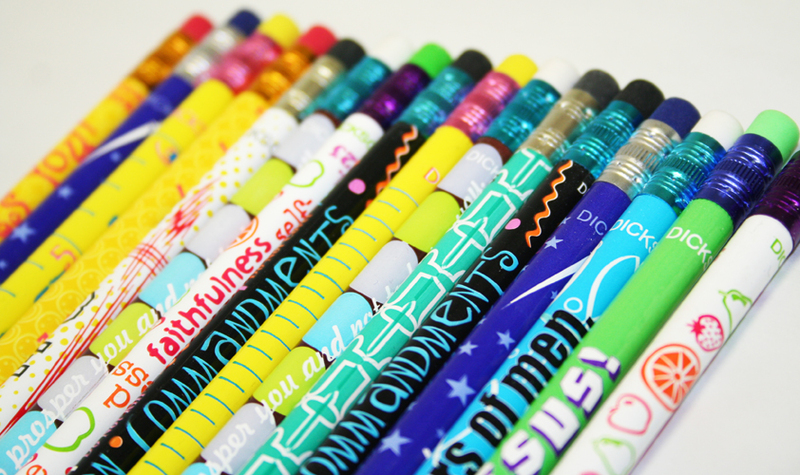 Can you give examples of the verses printed on the pencils please? A:Example of writings on these pencils are as follows; 'I will make you fishers of men' Mark 1:17 'God made me special' 'For God so loved the world that he gave his one and only Son...' John 3:16 Others will have lists printed on them such as the Ten Commandments and books of the New Testament.